I have no intention to create a soap that will satisfy your hunger. It is just a dream natural soap that will not harm a baby when it's accidentally being eaten or swallowed during bathing. Aside from it, if you can invent such soap, it will surely help ecologically and prevent environmental pollutions. When I was in Indonesia about 30 – 40 years ago, I have seen several sights of women washing clothes and children taking a bath along the rivers. There I noticed that they were using certain fruit nut and bark of a tree for washing, definitely NOT SOAP. A friend of mine told me that they do not use synthetic soap but the nut and its bark taken from soap tree. I did not pay attention about the soap tree during that time. Today, I realize that the soap tree must be one of the answers to environmental protection from pollution. The name of the soap tree is said to be Yukka or Sapindus mukorossi or just Sapindus, Quillaia saponaria, or Gypsophila. Since people have learned how to make soap, especially in this modern time where synthetic soaps are being made, beautiful rivers and wonderful oceans are no longer the same as before when our ancestors enjoyed swimming and fishing. Look at the riverbed or seabed; you may not find living things because of the presence of polluted sediments called sludge. If you analyze this sludge, you will find soap materials used by factories and housecleaning. Soap industries are producing more and more dangerous soap that will pollute the world. Of course, there are soaps and cleaning technologies (machines) that will not pollute our environment, but it costs a lot. Thus, their application is very limited. A good idea is to plant more soap trees, which contain useful amounts of cleaning substances. This may be one of the solution concerning environmental problems. Another good idea is to use ozonated water for washing. You can convert tap water to ozonated water simply by the process called electrolysis. Laundry with your washing machine and it does not require soap. Wipe your entire house with ozonated water, then all bacteria and viruses including fungi will be eradicated. Surgical and kitchen utensils will be sterilized without any boiled water and chemicals. Spray the ozonated water to plants in your garden and farm. The plants will grow better and you can kill all insects without chemical solutions. Wipe your skin with ozonated water, then allergies and other kinds of skin diseases can be eradicated. Fish in ozonated water grow greater than ordinary water. There are hundreds of advantages in using ozonated water. We just do not have enough and conclusive records about human consumption of ozonated water for health at moment. We need more studies, although hundreds of websites are selling ozonated water for human consumption. Is ozonated water a new invention? The answer is NO. Ozonated water was used since the time of our ancestors. People today did not realize that a certain kind of water fermented by our great grand folks was ozonated. Do you believe that? Uneducated old folks did not know about the word ozonated. About a kilo of cooked rice (you can use leftovers) and 300 grams of brown sugar mixed with 3 liters of water. Keep it for fermentation for about 2 – 3 months at about 35°C. It smells bad in the beginning, but sour and rotten smell will go away in two-month period. By and by, fermentation process will be completed, and clear water will be seen. This is ozonated water. You can use it for washing clothes and other materials. You can drink it, too. It's like juice or wine according to old folks. It is really a healthy ozonated water, isn't it? It seems that even bread or cookies will do the same. I myself never tried this, so I instructed my staffs and young research people to try it. Before WWII, according to our old folks, radish juice, rice swill (the water left after washing rice), ash, egg white, and animal bile were used in washing clothes and body. Well, go back to another story of substitute soap. Probably before and after the time of Christ and even the time of WWII, human urine was used especially at laundry shops. Our toilet was not flush toilet like today. 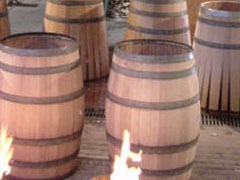 Mostly, barrel was used to keep urine. I myself used it when I was a kid. Feces and urine were separated. Feces were brought to farm, kept for fermentation, and used as fertilizer for plants. Our neighbor laundry shop came to collect the urine barrel everyday in exchange with a small box of match or some kind of gift each week. The urine was kept for fermentation and used as a bleaching agent. Fermented urine is poured to stone or fenced mud puddle and placed clothes and pounded by feet. After washing clothes, of course, rinse out the urine to the river. The river won't be polluted as fermented urine will help fishes and insects including plants in the river to grow healthier. Once the river reaches the ocean, crabs, shells, fishes and other seaweeds will then be healthier. That's how it was before the WWII. Today, synthetic soaps, which flood the market, are polluting everywhere killing living things of the world. 100% successful soap-making with used oil from your kitchen. 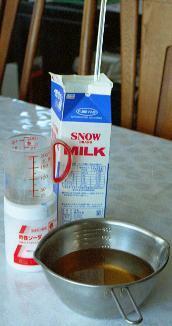 Wash the milk pack thoroughly and dry. Dissolve 50 grams of sodium hydroxide (lye) in 100 ml of water. If at all possible, do this outside or under an exhaust fan, or you can open the windows to ventilate the room as the solution will produce heat and gas due to chemical reaction. Add the sodium hydroxide to the water, not vice versa. Pour the sodium hydroxide slowly and in a steady stream, and stir constantly with a glass stick. Pour 370 ml of used oil gradually to the solution and stir slowly and constantly for about 10 minutes. You will have to stir several times for a half-day time in order to neutralize the solution. When completed, leave the solution as is and undisturbed for about one month. If the soap had been solidified, then you can cut it to a reasonable size of your liking.